I have a VERY UGLY Door that is right next to my kitchen...and my pretty new kitchen is not happy about that! I originally intended to get a new door when we remodeled the kitchen, but other things happened, the door fund went elsewhere...and well, while the door needs to be replaced...it need a makeover now! I had had enough. 1. I used the Krylon Frosted Glass Finish to give the old window a re-do. I wanted something for privacy but that would still let light in. 2. 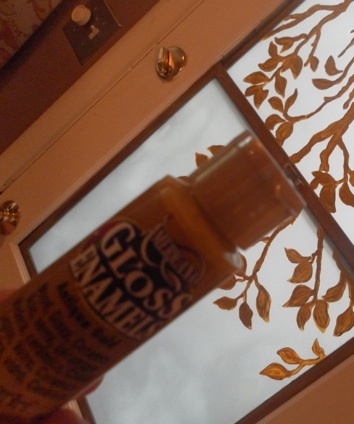 Then I painted the door and molding using Mythic Paint's Sugar Rush and my Purdy Brush. 3. It looked great just like that, but I wanted some fun and whimsy, so using DecoArt's Gloss Enamels added the Cutting Edge Stencil to the glass. 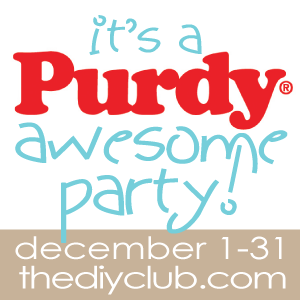 Go checkout The DIY Club for the full tutorial. I think my ugly door is now GORGEOUS! Thanks to some great products. So I still need to do something about the doorknob and lock, but overall, I am doing a HAPPY Dance! I tried to deny it for a long time, but using a quality paint, paint brush, and tools, makes all the difference in the time it takes to complete a project and the final outcome. Holly, what a creative way to take care of an ugly door. It is now a most creative and beautiful door. I just love the technique. I wonder how it would look on an ugly bathroom window? Merry Christmas, my creative friend! Very pretty results. I did not even think there would be a frost glass paint. Is it spray paint or applied by brush? The stencil is gorgeous too. Such a cute idea! Love how this turned out. I wonder if this same technique could be used on mirrors as well. my home is FULL of ugly hollow doors.... thanks for the inspiration! What a fantastic idea. And a great stencil to use for it too. I love the way it turned out. Clever Holly, and certainly worthy of the happy dance. ugly door no more! i love it...so perfect. Holly! This is just stunning! A ginormous transformation. I love it! I can see how you'd be doing a happy dance for that. It's gorgeous... and what a great idea! Totally gorgeous! What a creative idea...love it. That is absolutely gorgeous and fabulous in every way. No really....you WIN! Love it and I'm sure it makes your pretty new kitchen even prettier. I wish my brain thought that creatively. Total makeover success! This door looks beautiful from both sides, and in the day and the night! SOOO charming and exactly what I am looking for for our bathroom window that needs privacy. I am wondering if, along with the stencil, it would be as washable as a normal window? I could put the design on the outside of the window as it goes into our unheated porch, but that may also add it's own issues. Thoughts? Heather - there is not email for you and you come up as a no-reply-blogger. I hope you see this! I wash able to wash my window with gentle strokes. I used soap and water only - it will scratch is you rub too hard. I am really not sure about putting it on the outside. I have used Wallpaper for Windows in my bathroom before for privacy and it worked well.